The test was performed by first starting 1500 instances in batches of 20 every 3 minutes. Each instance was hosting one JVM running a small test application (see below for details), which joined the cluster. Akka Cluster is a decentralized peer-to-peer cluster that is using a gossip protocol to spread membership changes. Joining a node involves two consecutive state changes that are spread to all members in the cluster one after the other. 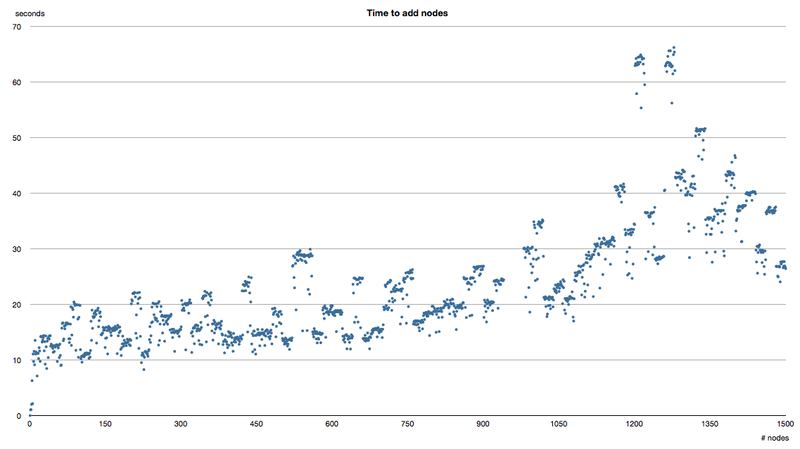 We measured the time it took from initiating the join until all nodes have seen the new node as a full member. As can be seen in the above chart, it typically takes 15 to 30 seconds to add 20 nodes. Note that this is the duration until the cluster has a consistent view of the new member, without any central coordination. Nodes were added slowly—stretching the process over a total period of four hours—to also verify the cluster’s stability over time with repeated membership changes. The time to join increases with the size of the cluster, but not drastically; the theoretical expectation would be logarithmic behavior. For our implementation this holds only up to 500 nodes because we gradually reduce the bias of gossip peer selection when the cluster grows beyond that size. During periods without cluster membership changes the network traffic of 1500 nodes amounted to around 8 kB/s aggregated average input and output on each node. The average CPU utilization across all nodes was around 10%. when adding more nodes we observed long garbage collection pauses and many nodes were marked as unreachable and did not come back. This was the limit of the Akka cluster software, and not a limit of the Google Compute Engine in itself. To our current knowledge this is not a hard limit, which means that we will eventually overcome it. In the first test the nodes were added slowly to also verify the cluster’s stability. Bulk additions are a more typical use case when starting up a fresh cluster. We also tested how long time it took to get an Akka cluster running across 1000 Google Compute Engine instances, hosting one cluster node each. It took 4 minutes and 15 seconds from starting the script until all 1000 Akka cluster members were reported as full members and seen by all other nodes. That measurement also includes the time it takes to start the actual Google Compute Engine instances, which is just mind-boggling—cloud elasticity taken to its extreme. The Google Compute Engine is a perfect environment for Akka Cluster and its ability to scale up and down automatically as nodes are spun up or shut down. We used the Oracle JVM, Java version 1.7.0_40 with 1538 MB heap and ParallelGC. The Google Compute Engine instances used in this test were of type n1-standard-2 in zone europe-west1-a, with Debian Linux (debian-7-wheezy-v20130816). It is priced at $0.228/h, has 7.5 GB memory, and 5.5 GCEU. We would like to send a big thank you to Google for making it possible to conduct these tests. Overall, it made Akka a better product. Google Compute Engine is an impressive infrastructure as a service, with the stability, performance and elasticity that you need for high-end Akka systems. Our guest blog post today comes from Patrik Nordwall, Senior Software Engineer at Typesafe. His areas of expertise include Scala, Akka, and how to build reactive applications.